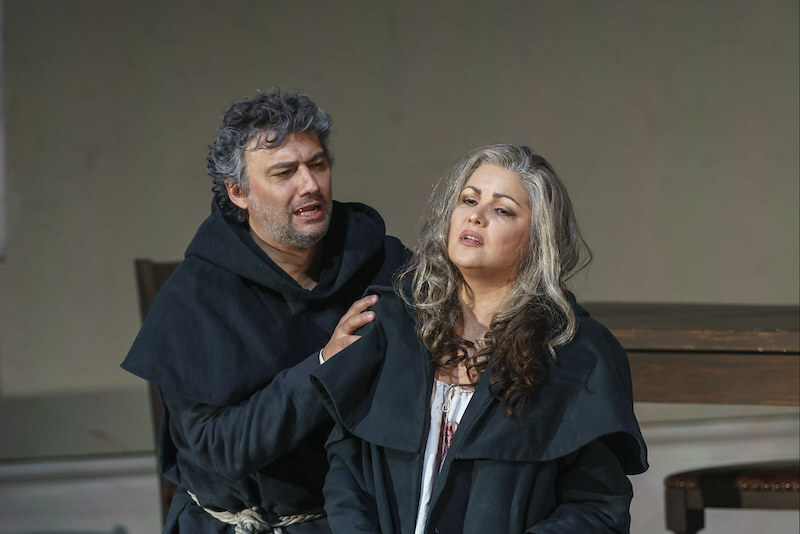 It’s always news when Anna Netrebko or Jonas Kaufmann grace the stage, and doubly so when they appear together: breath is bated not only over whether these sacred monsters will be up to scratch, but whether they will appear at all. For their joint appearance Verdi’s La forza del destino at Covent Garden, black-market tickets were going at £7,000 a pair, even a month before curtain-up. Kaufmann sings Don Alvaro who has killed the Marquis of Calatrava, the father of his beloved Leonora, here sung by the fiery Russian soprano. Alvaro had hurled his pistol to the ground in a gesture of submission, and it had gone off by accident: such was Verdi’s capricious ‘destiny’ at work in this labyrinthine story studded with disguises and mistaken identity. Cursed by her dying father, Leonora takes refuge in a monastery, while her brother Don Carlo, sung by Ludovic Tezier, pursues Alvaro in search of vengeance. Destiny decrees that Leonora and Carlo shall die, thanks to a malign series of improbable accidents, and that Alvaro shall live on in incurable remorse. The protagonists are all noble and tragic characters, but the rules of the blood-feud transcend those of basic humanity. Christof Loy’s production is set in twentieth-century Spain and Italy, though its period references fluctuate confusingly between the Thirties and Sixties. The designs are elegantly restrained, apart from the occasional appearance of a huge video of the original murder projected onto a back wall; there are times when Loy’s blend of naturalism and stylisation, supported by finely-nuanced lighting and smart-as-a-whip movement-direction, sets up a lovely synergy with the music. Loy has managed to reflect the huge and variegated canvas on which Verdi and his librettists conceived this work, and he’s given it compelling visual momentum. The scene in which Leonora, surrounded by monks, bids her farewell to the world and enters her cave as an anchorite is beautifully imagined (though one does wonder why the monks aren’t at least mildly excited by the fact that they’re importing a young woman). The off-duty high jinks in the army camp where the disguised protagonists are holed up spurred Verdi to write some infectiously carnivalesque dances, and Loy and his choreographer Otto Pichler have in turn been spurred to create something which is pure Broadway. Antonio Pappano spins this exhilaratingly along from the pit; all it lacks is a lead gypsy singer with the vocal charisma to carry it off. The cast includes two great Italian performers – Allessandro Corbelli as the travelling pedlar, and Ferruccio Furlanetto as Padre Guardiano, whose wonderfully resonant bass grounds the whole production. Ludovic Tezier’s Carlo makes the perfect foil for Kaufmann’s Alvaro, and it’s nice to report that the central pair are at the very top of their form. Netrebko’s Leonora is a mature woman in her splendid prime, rather than a vulnerable girl, but her singing is simply sublime, power and pathos under the smoothest control. Kaufmann’s top notes have the usual heroic gleam and his pianissimi are gorgeously focused, and although he’s put on weight recently he’s entirely convincing in his high-Romantic role.